AncestorPuzzles.com: Dad Sat in Reagan's Chair! Dad Sat in Reagan's Chair! With Father's Day coming it is a good time to reflect on our paternal lines in our genealogical research. 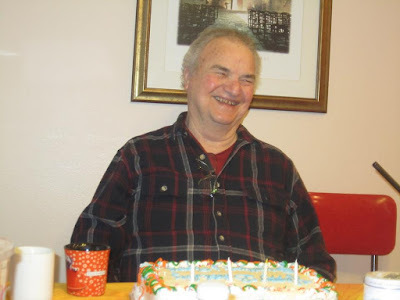 It is also a good time to visit Dad and get some of his stories down on paper. We can also review our paternal DNA matches. My most recent visit to my dad uncovered a story that I never recall hearing before about dad visiting Ronald Reagan's office with an old girl friend. Sometimes other friends and family members are in a better position to ask the questions and make note of the significant answers. I have interviewed my Dad numerous times at length over the last three decades. I have my wife, Robin, to thank for eliciting this wonderful story about Dad sitting in Ronald Reagan's chair. Dad and Robin were talking about our daughter in Los Angeles. That made dad remember the time that he was in Los Angeles with an old girl friend that worked for Ronald Reagan in his Los Angeles office. His friend, Barbara Smale, took Dad on a tour of her workplace and took him into Mr. Reagan's office and encouraged him to sit in the chair of a former governor and future president. That moment was indelibly etched in Dad's brain despite his current short term memory issues. 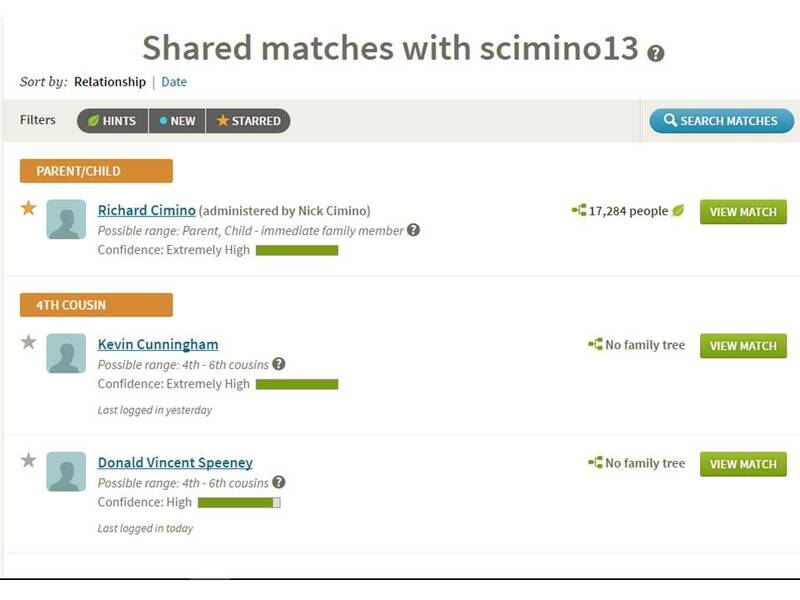 While reviewing the new Shared DNA Matches tool at Ancestry.com for my dad and myself, I noticed that my dad's first cousin, Sam Cimino, has taken a DNA test. Even better, Sam and I have some shared DNA matches as shown in the image below. 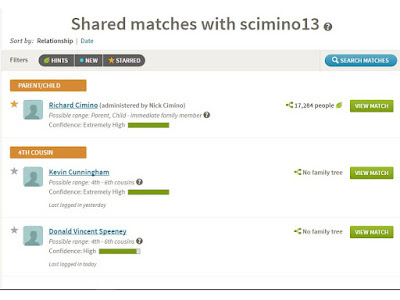 Shared DNA Matches between myself and dad's cousin, Sam Cimino. I fired off a message to both men on the match list to see if they were aware of any Sicilian ancestry. One of the gentlemen responded immediately to say that he was not aware of any ancestors in Sicily. As far as he knew his ancestry was in Campobasso and the other side of his family came from the Naples area. So I can add this one to the long list of mysteries that I need to solve. Father's Day is a great time to take advantage of the special sale prices being offered at all of the major DNA services. I wrote about Aunt Millie and her decline from dementia three years ago in this space. As these words are written, I’m preparing to go to Chicago to bury her. And thinking about what it means when a generation dies. I have no more blood aunts and uncles. Not on either side. My sisters and brother and cousins and I, we are it. We are the "grownups" now. We are the family. We are losing firsthand memory of you can’t walk here, and you can’t eat there, of you can’t try that on and you can’t look that man in the eye. We are losing our exodus, how it felt to flee Greenville, Jacksonville, or Shreveport on the first bus or train heading north or west, toting suitcases tied with rope and cold chicken in grease-stained paper bags. We are losing a unique perspective on history as each generation passes. Make sure that you spend some time listening to the previous generation and recording their oral histories. Then write and reflect on what those memories mean to you.